After designing this piece I tried to find a simple name for the series, but could not find any name that would click until 'Number Nine'. Usually nine is the perfect number for the beads around the edge of the smaller donut, thus the name. This version of this design comes with a rubber cord, leather thong or braided leather cord. This design also comes with hand braided kumihimo cords. Knotted with nylon thread. Gold filled or agentium sterling silver beads. The Black Onyx donut are 40 mm in diameter. The center donut are 25 mm in diameter. The clasps are gold filled or sterling silver with a lobster or trigger clasp. The center medallion is sold out. The crystal center donuts are no longer available. 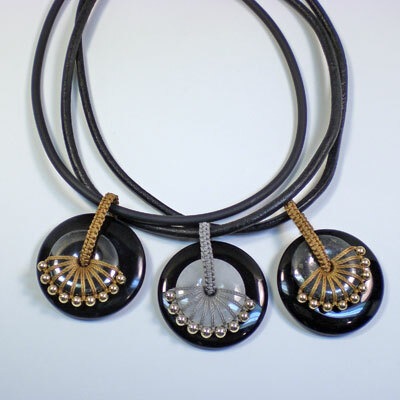 A new version is available with an Hematite center.